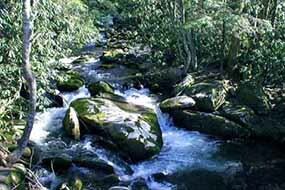 Cherokee Orchard Road is a short beautiful drive with lush forestry and scenic mountain vistas. From Gatlinburg Historic Nature Trail bear to the right when the road forks. Foothills Parkway West offers great views of the mountains and valleys of Blount County. There is an overlook which is great for photographers. From Walland (just outside Townsend, TN), take Foothills Parkway West (you will see a large sign for the Parkway). Frequent overlooks provide sweeping mountain vistas, and roadsides provide some of the best displays of summer wildflowers in the Smokies. Heintooga-Roundbottom Road is a driving trail that descends from the high altitudes of the Balsams down into the coves of Roundbottom and Cherokee. Heintooga-Roundbottom Road is accessible from the Blue Ridge Parkway at the Cherokee entrance of the Park. Continue all the way up to the mountaintop and make a left turn at the Balsam Mountain Campground sign and continue until the paved road dead ends just beyond the campground. This is a one-way road so once you start there is no turning back. The first fourteen miles are bumpy, winding, and sometimes steep. When you come out of the woods, it looks like the road dead ends into the water. Actually, you drive right through the water on a concrete ford. Park here, take your shoes off, and enjoy the cool mountain water! From this point it's a two way gravel road back to Cherokee. When you dead end into Big Cove Road take a left turn to go to Cherokee! 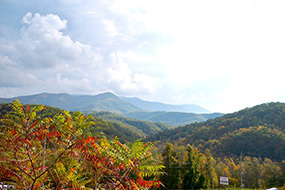 It provides spectacular views of Fontana Lake and the Appalachian Mountains and was originally named "Lakeview Drive." However, since the road was never completed (as the government promised) residents who were forced to leave their homes in order for Fontana Dam to be built gave it the name of "The Road To Nowhere." This road was originally to be built to provide the many residents who gave up their land for the Fontana Dam project access to their ancestral gravesites. Directions: Take the Bryson City Exit 67 off US 74, come down the hill, at the first red light make a right, at the second red light make a left, go straight through the third red light, over the railroad tracks and straight up the hill to the Swain County High School (high school will be 1-2 miles on your left from the red light). About 1-2 miles past Swain County High School you will see the sign on the left side on a bank that says this is the Road to Nowhere. 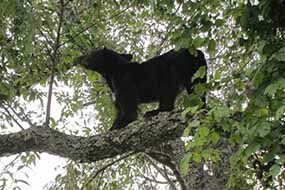 Immediately after you will enter Great Smoky Mountains National Park.